I adore the ladies over at Sewing With Boys, so even though I don’t have a boy I normally sew for, I knew I’d love their newest endeavor. The Time To Travel ebook has been released, it’s on tour, and it’s amazing. There are a lot of eBook sewing patterns out there and most of them simply have a lot of different views of the same pattern along with some tips or extra instruction along the way. This eBook however, reads like an informative magazine. 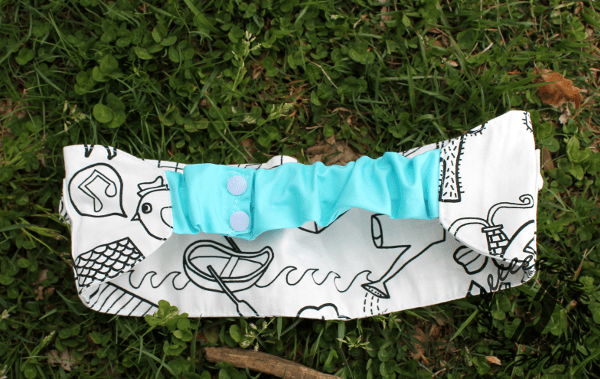 There are four PDF patterns with full pattern pieces, but there are also a bunch of fun activities and distraction ideas focused on traveling with little ones. The first pattern I chose to sew was the Adventure Belt. I knew Bean would get a kick out of having a place to store all her “treasure” while exploring. It’s hard to tell in the picture, but there are two big pockets with velcro flaps on the belt. I used more of the TIDNY fabric from IKEA for the belt since I thought it was a fun use of some scraps. The back of the belt is one solid piece so you could use a contrast fabric there too. The only change I made to the super easy pattern was to omit the buckle and add snaps instead. My girl still doesn’t know exactly how to undo a regular buckle and since I still buckle her in the cart at the grocery store, I’m not in a huge hurry to teach her, hehe. I used two pieces of 3/4″ elastic channeled in a fabric tube that is a little longer than the elastic to create a ruffled look. It’s similar to how I make the Ruffled Bow Belts for my girl. 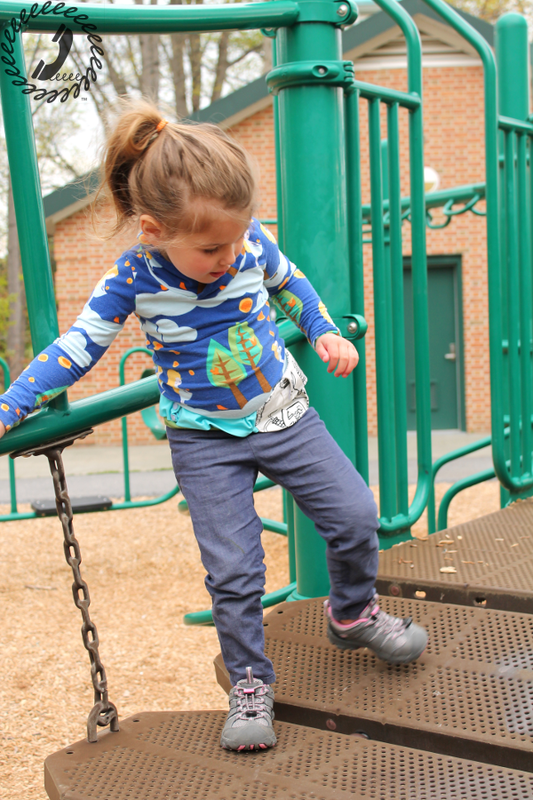 The elastic will function like the adjustable buckle and allow her to use it for years since it stretches nicely. And use it she will! 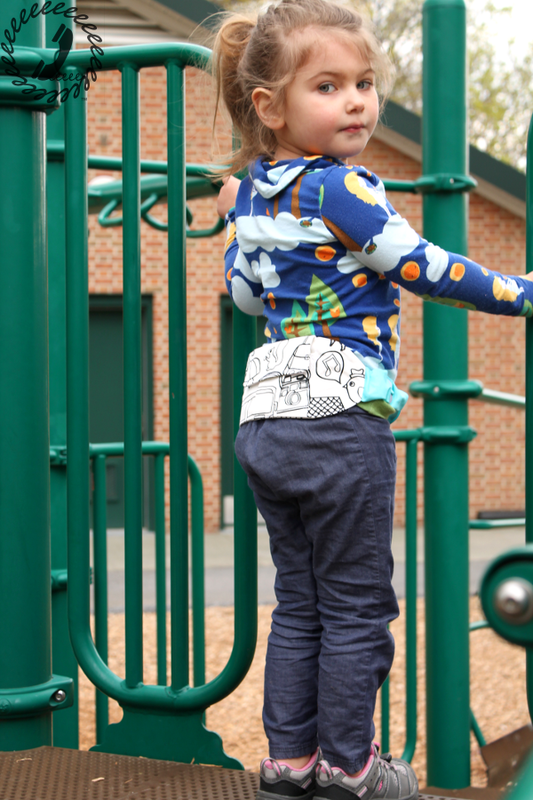 We went to the park and she had so much fun exploring with her “Explorer Adventure Belt.” I accidentally called it an explorer belt when I first showed it to her and even though I corrected myself right away, she still calls it the Explorer Adventure Belt, hehe. It stood up to the playground test. I was worried it might unsnap or be uncomfortable, but she LOVED it. She had to show her friends all her “treasure” she had collected before they arrived. 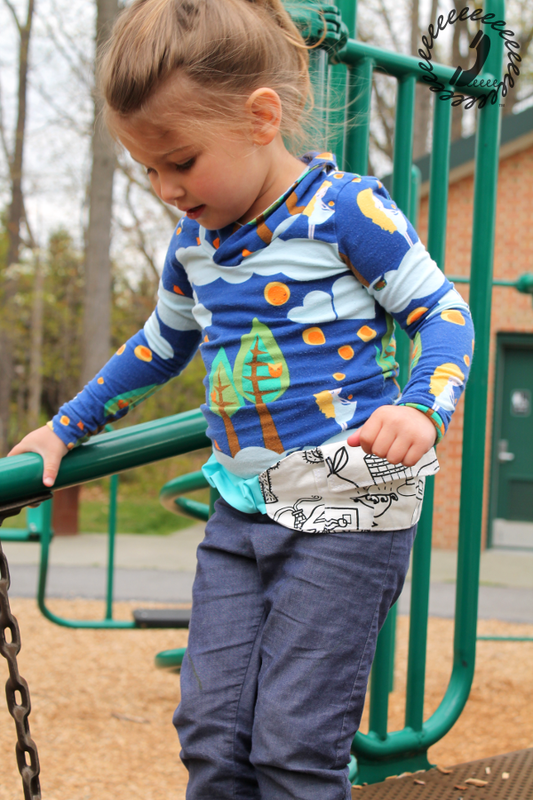 Those two pockets hold a lot and would be the perfect place to store her little figurines while on adventure. There is so much more to show you about this awesome eBook, so keep an eye out for a second post with some extra Time To Travel goodness in it later this week. In the meantime, the eBook is on sale (no coupon necessary) until the end of the tour (5/1/15) so pick it up at the discount while you can! If you order it during the tour you will be entered to win a gift certificate for Fat Quarter Shop which is pretty exciting. There’s also a great Rafflecopter giveaway to enter to win a gift cert to a fabric shop or a copy of the book. Don’t let that slow you down from purchasing the eBook during the tour, however, because they will refund the cost of your eBook if you are the winner! And of course check out all of the other great inspiration from the tour! Ajaire I love this so much!! I'm saving my scraps of that IKEA fabric – this is such a great idea! And changing up the belt to a ruffled belt is so fun and such a cool, girly hack 🙂 Thank you for hanging out with us!! I love the belt for your girl…now I'm inspired to put my Ikea fabric to good use for *my* daughter! Thanks so much for joining the tour!! This is such a great idea! 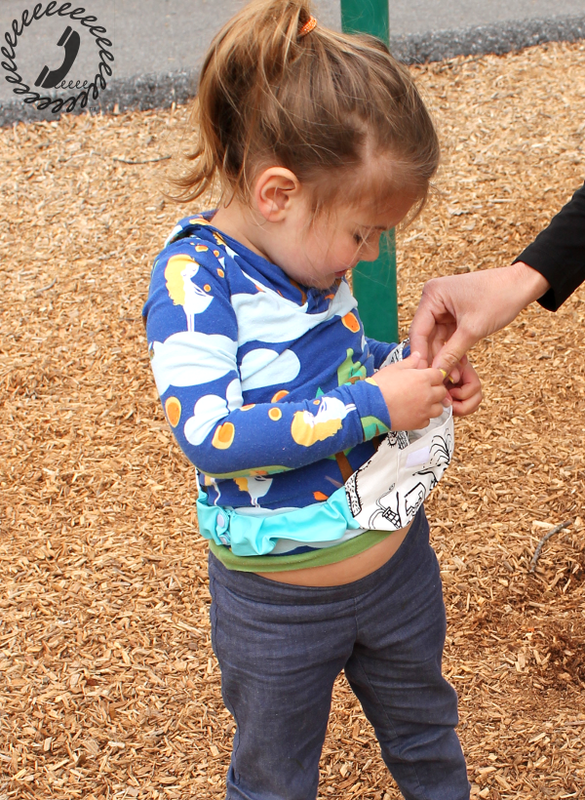 My daughter is always dropping her discoveries for lack of pockets (or big enough hands lol) – she'd love this! So fun! I love this fabric and what a great way to make it a bit girly! This is such a great idea!!! Love those fabrics too! Thanks for sharing! Thanks for having me Amy! I was really wowed by the whole book! You guys should be proud!